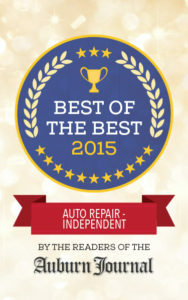 The Master Technicians | Have Your Brakes Been Inspected? In our almost two decades of providing automotive repair service to the Auburn CA area, we have found that all of our customers understand that brakes are the most important system on a vehicle. Anyone who drives a vehicle, has had to do an emergency stop at some time in their driving career. This is the time you really need your brakes to function perfectly. Regular brake inspections are the key to keeping your brake system in optimum operating condition. Regular inspections protect you and your passengers, and can save you money by catching any issues that may exist, before any damage may occur. Many shops may do a quick visual inspection but this will not catch all of the problems that may occur. Our full brake inspection includes removal of all four wheels for a thorough inspection. We remove all calipers, lube slide pins, measure pad/shoe thickness. Measure rotor thickness, drum diameter, and test drive for vibrations. Since we remove all wheels for our brake inspections, we also include a complimentary tire rotation. So if you are due for tire rotation, contact us to make an appointment or stop by. Contact us to schedule an appointment for your Brakes! We know it is difficult to be without your vehicle. We hope our free shuttle service will make getting to and from work or home care free. Ask us about this service when you make your appointment.